In the age of the Internet, it seems like there are no secrets anymore. There is an answer to everything. There’s nothing you can’t Google, lookup, or find out in a matter of seconds. Information is all around you, and it seems limitless. This is true for so many things, but when you step into the world of magic, you start to notice that the answers aren’t always easy, accurate, or reliable. Yes, even at a time when it seems there are no more secrets, magicians have managed to keep some of their illusions under wraps. The magic community is still close off from the rest of the world in small, but distinguishable ways. You probably didn’t even realize this was possible, right? After all, there have been numerous expose shows, blogs, and videos that uncover secrets at every turn. But there is still some mystery in magic, and some magicians have been able to shield their tricks from the world if even just a little bit. Nothing exemplifies this more than the floating table magic trick. The magician message boards are perhaps the most helpful places, but even there the information is spotty and unreliable. In fact, even finding a history of the floating table, much less its secrets, seems to be nearly impossible. There is very little information about the trick’s origin, or how long it has been performing for. Part of this is understandable. Once a trick revealed it’s not as valuable to the world of magic, or to the person who creates it. 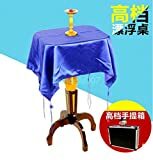 If everyone knows the secrets of the floating table, then anyone can build one, anyone can perform the trick, and anyone can make money from it. By limiting who privileged with the knowledge of how to perform the floating table magic trick, you limit who can benefit from it. That would explain why the comment section on any of the videos that posted tend to be vicious and charged. Magicians definitely don’t want their secrets out there for everyone to copy. For you, this might be hard. Not because you want to run away to a life of performing magic tricks, but because you like answers. For you, a trick or illusion is only fun if you know how it’s done. Not knowing just frustrates you. It eats away at you. When you see a trick like the floating table you need to know how it’s done for your own peace of mind. Of course, withholding this information is part of the fun for magicians too. They have pulled one over on you, and you can’t even figure out how. You could ponder the floating table over and over again, and yet you won’t be able to truly know the answer unless it’s explained to you. 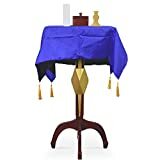 So, due to the lack of reliable information available about the floating table, you are left to speculate and gather information where you can. Let’s start by examining the type of trick it is. The floating table belongs to a group of magic tricks that are known as levitation tricks. 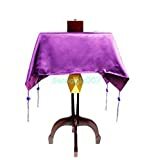 The floating table is also known as the spirit table, and much is written about the way this trick was used by mediums and psychics during séances. The modern-day floating table trick may get its inspiration from the floating séance tables of old, but it’s clear that the methods are different. The spirit tables were often lifted off the ground with the help of planted participants who were working for the medium in order to hook potential customers. But still, in either case, a performer is using an illusion to defy gravity. It’s no accident that levitating or gravity-defying tricks have captured the audience’s attention for centuries. Gravity in itself is a kind of magic. You know that it’s always here, and always working, and you know it can be explained, and yet, it seems beyond explanation. That’s why it’s easy for magicians to pretend to mess with gravity. It will always enthrall audiences. This can achieve by levitating people, or objects, as with the floating table. 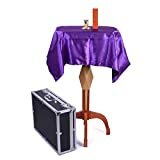 The floating table trick as it known to magicians today involves taking a small side table, something that a lamp would probably sit on, and cover it with a magician’s cloth and a small wooden box. Once these elements are in place, the magician is able to get the table to levitate several feet off the ground and move from side to side and up and down. After watching the trick, many people assume that there must be wires that extend from the table to a fixed point, but many demonstrations from magicians defy this explanation. They move freely with the table, so the question becomes, where are the wires attached? A quick look at some of the magician message boards and you’ll notice a name start to pop up over and over again about the light table. Losander Amateur magicians ask others in their field about how to build a Losander table. The table is the key to the trick. Many magicians ask if they can build their table because the original Losander table runs upwards of $1200. Time and time again magicians ask others for ways to make their table to save money, but they told that buying the table is the best and only option. It’s clear that what you’re paying for is not the table. You are paying for the secret to the trick. On his website, Losander bills himself as the master of the art of levitation, and he claims that his Losander floating table is the best table levitation trick around. He created it over 20 years ago, and it has been captivating audiences and other magicians ever since. Other famous magicians support this claim, and they ask that magicians honor the original and not seek a copycat table. Sparse videos on YouTube with no working sound offer half of the picture when it comes to the floating table trick. By observing the one here, you’ll notice that a sort of metal arm inserted in the top of the table. This arm is hidden by the magician’s cloth that placed on top of it. The metal arm tells some of the stories of the trick, but not all of it. There’s still the significance of the box that placed on top of the table. Is it to draw your attention away from what is happening? Is it to disguise where the metal arm inserted? There are a few other videos you could examine, but most of them are after trying to sell you a product that will promise you answers. It’s clear that when it comes to the floating table trick, the answers not supposed to be free, or easy. Of course, by watching Losander perform the trick, you’ll notice what most practicing magicians know all too well. It’s not the trick that’s hard; it’s the performance. Losander makes you believe that he his levitating the table. He draws you in. You know there is a logical explanation for how he is achieving the effect, and yet, it defies logic. He makes you believe that the table is floating. By paying money or infiltrating the magic community you could gain access to this secret knowledge. But you wouldn’t be able to make much use of it. Knowing the steps and secrets doesn’t make you a magician, and once you know the answerers, the magic is gone. The floating table trick won’t likely remain unrevealed for long. If YouTube is any sign, people have spent years trying to expose the method, and they won’t rest until they do. So you can take heart in knowing that the mystery will solve, or you can take heart in letting it stay, at least somewhat, a mystery. It may eat away at you, but when it does, watch a magician perform the trick and revel in their skill.